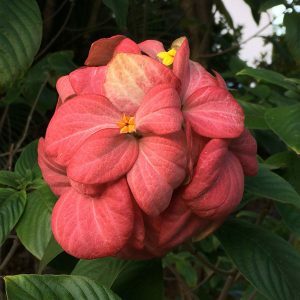 Mussaenda are commonly known as the ‘Bangkok Rose’ and plants are available in a number of forms including Mussaenda philippica ‘Aurorae’ or White Tropical Dogwood. Pink flowering, White and Red varieties can be found, all attractive small trees to shrubs that will reach around 2m in height. The flower itself is small, however the bracts or inflorescence that surrounds it is very large, colourful and attractive. M. ‘Dona Luz’ is a very popular and attractive dusky mid pink flowering cultivar. M. ‘Queen Sirikit’ has softer pink flowers. M. ‘Marmalade’ has orange and yellow flowers. M. ‘Capricorn Dream’ with its brilliant red sepals is very showy. M. ‘Capricorn Ice’ has white sepals with deeper yellow flowers. Mussaenda are really a tropical plant, some forms such as M. erythrophylla will survive as far south as Sydney in ideal conditions. In cooler climates and in areas with dry winters, these are a deciduous plant, in the tropics they can hold foliage year round. Flowering time is summer, however they will spot flower right through until early winter. All species require sun with a little afternoon shade if possible. A humus rich moist soil is best. A drip system to maintain moisture is advisable. You can grow these plants from cuttings, best taken as hardwood cuttings in spring. Use a rooting hormone and keep the plants in a humid environment until they strike. Once new growth begins you can slowly harden them off. Best grown on in pots for a year before planting out, or potting up. M. frondosa – A smaller shrub to around 2 metres. M. luteola – This is a dwarf species, white sepals with yellow flowers. M. erythrophylla – An interesting species in that it can be used as a climbing plant. M. phillipica – Very attractive white flower bracts. M. glabra. – Another draw variety with white to yellow flowers.